Every year during the Austin City Limits Music Festival in Zilker Park, you can expect that at least a few artists will tape an episode of the Austin City Limits television show. This year, as the new season starts to air (Radiohead’s performance aired on 10/6 and Bon Iver aired this past Saturday), they’re continuing to add more artists to fill out the rest of the season. Jack White taped an episode Sunday night at the Moody Theater. 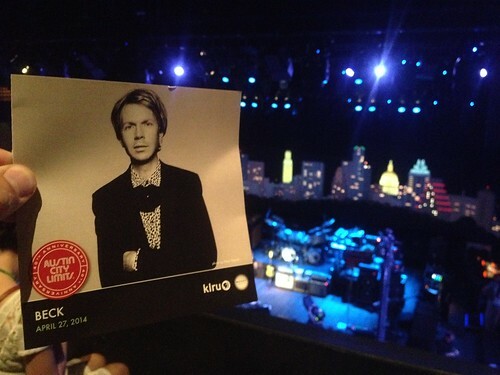 The Austin City Limits television site is posting its own taping recaps now. They have a pretty comprehensive background on the night including a set list. There’s also one from the Tim McGraw taping in August. Norah Jones also did a taping late this week. Jack White has graced the Austin City Limits stage once before with Raconteurs in Season 32 (2006) which coincided with his first appearance at the music festival. The Raconteurs played the festival again in 2008 and he famously had to cancel the White Stripes headlining slot at the festival in 2007 due to Meg White’s health issues. I’m assuming that his choice of set list as a solo artist was influenced by the desire to get some White Stripes songs on Austin City Limits. I’ve been to several tapings over the years and this was the first one I can recall where the artist was allowed to alter the set. They didn’t obscure or block the Austin skyline, but they changed the stage from its usual black to white and had two spotlights that bathed the bands in a blue or white light. It managed to give them their own style while still sticking with the Austin City Limits tradition. White has two backing bands and switched between them halfway through the set. He appeared to have brought his own Hasidic appearing road crew to manage the switch. I don’t want to touch off a gender war, but the all male Buzzards, the first backing band, definitely rocked harder than their female counterparts, the Peacocks. I enjoyed both thoroughly. The Buzzards, all in black, consisted of drums, bass, fiddle, keys and a multi instrumentalist. The Peacocks, all in white, had one more member than the Buzzards. I’d never noticed this before, but the keyboard / piano setup at stage left had a rather large mirror for the keys facing stage left so that the player could still see Jack and the rest of the band. Jack ended up restarting “Hypocritical Kiss” with the Peacocks so they could get it right. I think he was the one that made a mistake or the tuning was slightly off. Being a drummer, I noticed that the drummers from both bands, Carla Azar with the Peacocks and Daru Jones with the Buzzards sit very high over their kits. Jones also angles all of his drums downward away from him at a fairly steep angle. To each their own, but I can’t see being able to play like that night after night. Look for this episode to air in January.